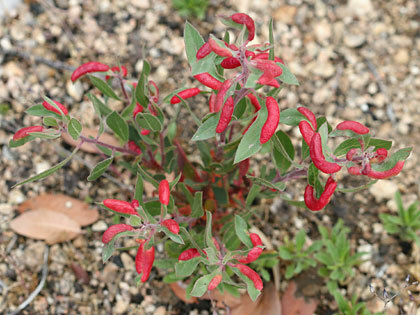 I visited Molino Basin in April of 2005, and I saw from a distance what I thought were small, red pepper plants. Upon closer inspection I discovered that they weren't pepper plants and the "peppers" were actually bright red leaf galls or growths. Most of these leaves had only one side affected, but one unfortunate plant was a mass of bulging red growths on both sides of the leaves. I have never seen anything like this before, both attractive and repulsive, and I don't know what might have caused it. Update: I believe that these galls may be due to the Manzanita Leaf-gall Aphid (Tamalia coweni). This aphid causes red leaf galls on manzanitas. The Aspen Fire of 2003 burned part of Molino Basin and these small plants may either be new Arctostaphylos pungens (Pointleaf Manzanita) plants or burned plants resprouting from the surviving roots. The established, non-burned manzanitas don't have these strange, red leaf galls.